It’s been 37 years since that morning when we awoke to find that you were no more among us. We were shocked beyond belief, although there were many who rejoiced that you had gotten what (in their opinion) you richly deserved. Like you, we never believed that they would hang you. Like you, we were convinced that Libya and UAE would prevail upon Ziaul Haq to send you into exile. But you had burnt your boats. There was only one grave and Zia knew that if he spared you, that grave would be his home for all eternity. There have been times when we have wondered what kind of man you were. We know, of course, that you made many mistakes, mistakes which proved costly to you and to the country. But more of that later. “Sir, history will record that you were a great man, greater even than Quaid-e-Azam Muhammad Ali Jinnah”. Really? How could you even compare Mirza with the great Quaid? Okay, let’s overlook this. You were a young man in a hurry – you flattered the man so he could make you a minister. But then, you did not oppose Ayub Khan’s coup. You even joined him as a minister. If you were a real democrat, you’d never have supported a dictator like him. It’s not as if you didn’t have a choice. Oh, I forgot. You wanted to be great; you wanted to be powerful, so you had to support him. In 1965, you got the country embroiled in a war which saw Lahore almost falling to the enemy. You should have had the foresight to anticipate that the Indians would never take the loss of Kashmir lying down. Fortunately, our brave armed forces repulsed the enemy and the country was saved. Fast forward to 1968, you ditched Ayub, you made a brouhaha about the Tashkent Declaration (without telling us why that bothered you), you founded a new political party and you promised the masses what you knew you could never give. The poor were taken in by your slogan ‘roti, kapra, makaan’. The poor masses of Sindh and Punjab gave you their votes because they were duped. Did you really believe you could give a house to each and every poor man in the country? How could the people ever forgive you for deceiving them? Then there was your role in the break-up of the country. 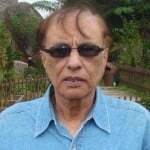 You refused to accept the results of the 1970 elections, in which Mujibur Rehman emerged the winner. All you had to do was to accept gracefully and allow him to form the government. Yet, you objected when Yahya Khan called him the future prime minister saying that a man who until the day before had been described as a traitor, was now being considered to be the prime minister. 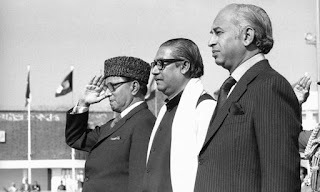 Realising that you could never be prime minister as long as East Pakistan was part of the country, you asked that power should be handed over to Mujib in East Pakistan, and you should form the government in West Pakistan, in your notorious ‘idhar hum, udhar tum’ speech. That was the day when Jinnah’s Pakistan died, Mr Bhutto. And when the National Assembly session was scheduled to be held in Dhaka, you threatened to break the legs of any of your party members who went there to attend (because that would have ensured the election of Mujibur Rehman as the prime minister of the country). After that, matters got out of hand and Mujib was jailed. Yet in the nine months between March and December 1971, you could have played a decisive role and saved the country. You could have demanded that Mujib be released and the crisis be resolved. But no, you wanted to be prime minister at all costs, you did nothing, and so the inevitable happened. But even when the Indians had invaded the country, and adoption of the Polish resolution could have spared us the humiliation our army suffered, you made sure that the country would be dismembered. You tore up the resolution and walked out of the Security Council. 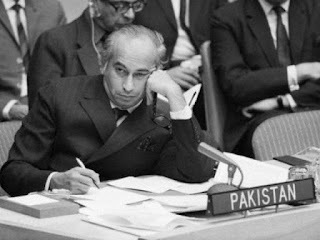 Mr Bhutto, we can never forget that moment in our history. The loss of East Pakistan may not have meant much to you, but it was a death blow to those of us who loved the country. Your supporters say that you were a democrat. You were the most autocratic leader the country had ever had until then. You violated your own Constitution a few hours after it was adopted, suspending fundamental rights. And when you were in prison, you appointed your wife to lead your party, despite there being many competent persons around you. Would a democrat ever have dismissed the legally elected governments of Balochistan and K-P (previously known as NWFP) without due process? 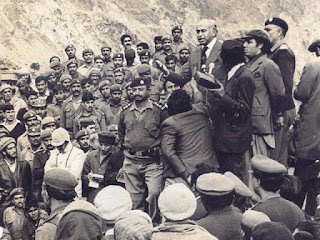 And there is much more that we cannot forget, Mr Bhutto. All countries of the world had admired Pakistan for its industrialisation, since it had started from scratch in 1947, and in about 25 years, it had become a country for nations like South Korea to emulate. You nationalised industries and almost every successful enterprise that existed. This was another death blow to what remained of Pakistan. All the inefficiency and corruption we see today in government, in the steel mills, in PIA, have their roots in the destructive policies of your reign in those days. No, Sir, we can never forget nor forgive you for what you did to Pakistan.